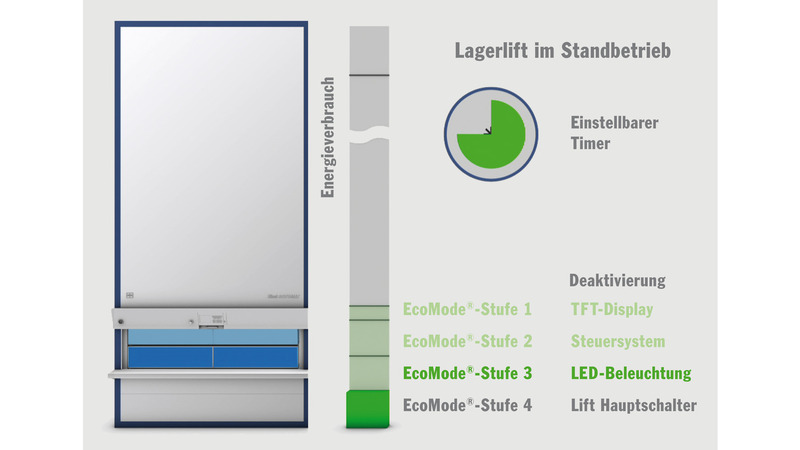 All systems that consume energy even when at standstill are closed down by the control system in 4 EcoMode® levels (energy-saving levels). This reduces the energy intake of the Hänel storage systems to a minimum when they are not being used. Down to EcoMode® level 3, the carousel returns to full operational readiness in a very short time once the controller is actuated. 1. The background lighting of the TFT display is switched off. 2. Components of the electrical control system are switched off. 3. The lighting is dimmed. 4. The carousel is turned off at the main switch.